Gorgeous neclace! Please enter me! +1 Fave item = Victorian Brass Bird Locket–love it! +1 My fav item : Vintage Brass Victorian Steampunk SKULL and CROSSBONES Etched LOCKET Necklace = BEAUTIFUL! I love this necklace and would love to own it. Looking at your jewelry I actually would have picked this one first. But some of my other favorites were the Hugs and Kisses necklace and the Don’t Mess With Me necklace. 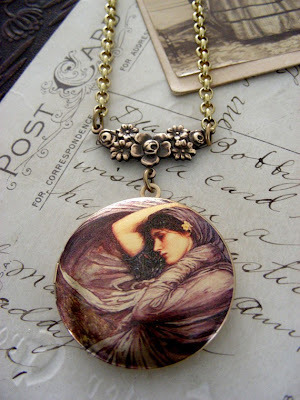 J W Waterhouse is my all time fave artist and that pendant is gorgeous. Please count me in. This necklace is simply beautiful! So cute, but this actually remind me more of Twilight of Avalon, the book, because that’s actually in the cover. That necklace is lovely. Thanks for the giveaway! +1: A Rose Is A Rose – LUSCIOUS Antique Rose Art DECO Vintage EARRINGS are gorgeous! Thanks for your giveaways and help w/ Japan! +1 Love the lovebirds locket! +1 Heart the shop (SweepstakeLover). +1 I like the CARNIVOROUS – VINTAGE BRASS STEAMPUNK SNAKE CUFF BRACELET. Please enter me in! I adore this necklace! Beautiful necklace! Thanks for the giveaway. What a beautiful romantic piece. Oh!! Thanks for the giveaway!! That is adorable, please enter me! I follow you on GFC as Saretta, twitter as sarettagd and Facebook as Sara Donahue. I’m sorry I couldn’t get all my entries into one comment, but I got all mixed up… Anyway, all together they are 7 entries. Thanks! 12 entries! Thank you for the giveaway! ashelynnsanford at hotmail dot com. Hi thanks a lot for this lovely giveaway! This necklace and,above all the COLOUR, really stole my heart. The necklace looks amazing! I can’t wait to read this book, it sounds awesome. +1 I am also subscribing to your blog!